With the hit CW series The Flash, Greg Berlanti has accomplished something that DC Chief Creative Officer Geoff Johns never could: make people like Vibe. 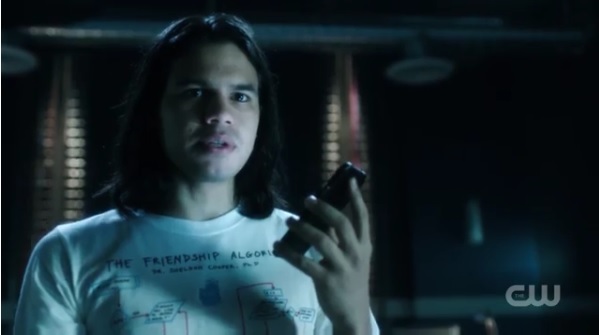 Oh, Cisco Ramon (Carlos Valdes) isn’t actually Vibe yet, and his power set differs from those in the comics, but there’s no denying that Cisco, like his hair conditioner game, is on point. In this first entry of “Chronicles of Cisco,” a new webseries meant to fill in gaps on The Flash or just give us more Cisco, we see STAR Labs’ star scientist trying to find a way to make the Flash’s suit bulletproof. Of course, danger has to lurk in the shadows. And we get further proof of the strange parallel worlds reality that Cisco is a fan of The Big Bang Theory, a show in which time and time again the male cast members have proven to be fans of the Flash.